* Full cross-browser compatibility: supports the latest version of IE, Google Chrome, Firefox, Opera and Safari. * Seamlessly integrates with Dreamweaver, Front Page, Expression Web and Adobe GoLive as add-ins. 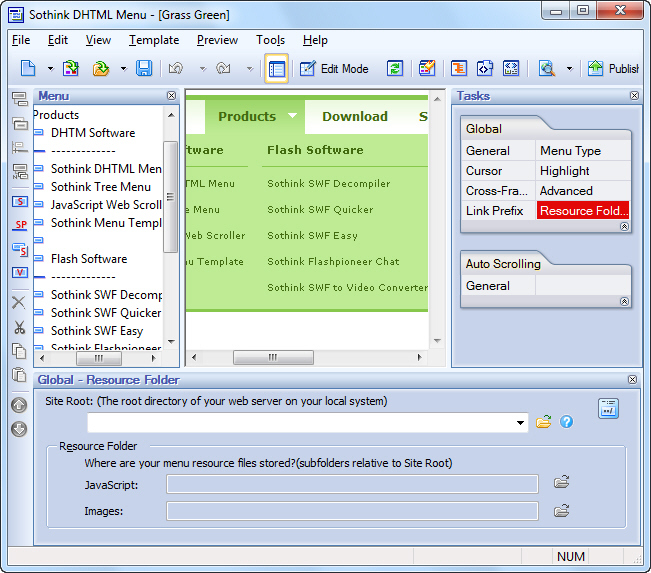 * Easily creates functional menus, such as tab menu, highlight menu, scrolling menu, cross-frame menu, multi-level/multi-column menu, custom menu, floating menu, right-to-left menu, keyboard navigation menu, etc. * Customizes menu properties, like font, icon, background, border, cursor, tool tip, surround, effects, alignment, transparency, size, etc. * Selects and edits images as icon, arrow, background and separator from Image Library and Background Library. * Offers rich built-in templates, styles and image library. * Supports W3C Valid XHTML 1.0. Added 15 new built-in templates. Auto-check the latest version: the program will prompt you if a newer version is available, and after confirming upgrade, you can enter corresponding web page and download the new program.